Asheville's premium spa for age reversal with Botox® injectables, skin laser services, and cell therapy. Our Board Certified Physician, Dr. Allan Zacher, gives you peace of mind and amazing results through decades of experience and the use of cutting edge technologies. Dr. Zacher is a great doctor. I feel like he actually cares about the patients he sees. I have been going to him through the weight loss clinic that he does and he is always striving to help me reach my goal. Every appointment he always has a good tip for me to follow or some good advice to help keep me on track. He also reminds you that you are human and it is okay if you back slide a little. A great doctor that really cares. Loved my experience with mountain radiance from my first phone call. They were able to get me in on a Saturday and when I had questions the day before my appointment, Dr. Zacher called me himself to answer them. At my appointment he was very kind and had great bedside manner. He took time to explain everything and made me feel very comfortable. My whole experience went above and beyond my expectations. I will most definitely be back! The valet parking and posh spa rooms set the stage for a variety of treatments. Dr. Zacher does an excellent job with the services he provides. Today I had my first Kybella treatment from Dr. Allan Zacher. There were short "pin pricks" in the process (which only took about 5 minutes once he started the injections); it is now about 2 hours later and most of the discomfort (slight burning and tightness) is already gone. I expect the swelling will be done in a day or so. Dr. Zacher was very easy to talk with from the beginning and during the procedure. In doing my "due diligence" I found that he had done this treatment many times and that reassured me. I will have a second treatment in four weeks and will report more about how this has worked to minimize my "double chin"! I am having a sun spot removed and I am so excited to finally clear up my skin. Dr. Zacher has been wonderful and the ambiance of the office is tasteful and welcoming. I feel like I am doing something special for myself when I come in for treatment. Mountain Radiance has been a life saver for me. The weight loss program is helping me reach my goals monthly. They offer many other fantastic products & care. Love the staff! Please check them out online or go give the office a visit.7/18/16, update, I'm down 35lbs since Dec. 17th. I've learned to eat small portions, healthier foods, hydrate properly & exercise daily again. I'm feeling & looking so much better! I have about 28lbs to go & Dr. Zacher keeps me pumped up. He encourages & recommends new ideas monthly. I'm so grateful for him & Kelly! I made a promise to myself & I will keep it! Thank you Mountain Radiance for caring!! Dr Zacher is just the perfect mix of professional, personable and practical. I believe he under promises and over delivers! I give him top marks and don't hesitate if looking for health and beauty tools and techniques. I went to this spa for treatment of age spots and have been thrilled with the difference my three IPL treatments have made. The staff as well as the board certified physician in charge are warm and generous people who welcomed me and made me feel at home. My age spots are gone and the texture and tone of my skin are much improved. I highly recommend this professional spa; they will continue to be my go to place for cosmetic procedures. I've been there twice and each experience was professional, warm, and on the level with what could be done on my wallet. Great place for Botox or juviderm or anything else to make you look and feel younger and prettier. Great experience here. Staff is warm and friendly. I had Botox treatment for crows feet. The injections were painless and the results are amazing. Couldn't be happier. I will definitely go back. Such a great spa. Very relaxing and everyone here is very friendly. Great location and the valet parking is a huge benefit. High end spa with affordable prices! Beautiful spa. Great location. Very knowledgable staff! Would highly recommend! Dr. Zacher is highly skilled and extremely personable! When I went t see him for the first time and told him what I was looking for, he really listened to me and gave me exactly what I needed to get the results I wanted without being overly expensive. He takes my budget into consideration and I will definitely be a repeat client, I am so glad I found him! Dr. Z is great in telling you what can or could be done, what should or shouldn't be done, the why's, pricing, etc. - straight talk I appreciate and find refreshing, not let's see what all can be dpne tp run up a sticker shock bill. His touch is great, fast and never had any issues with natural looking results. I’ve been getting JUVÉDERM for my lips for five years now, and I really love the results I get, but the pain of the injections is typically very unpleasant. Today I had my first appointment at Mountain Radiance Medical Spa with Dr. Zacher. He is amazing! Not only is this the first time I haven’t felt any pain from the injections, the results are better than I’ve ever had! Dr. Zacher is a miracle worker! I am so pleased with this place. There's never a wait, the doctor is always pleasant, and there is an efficient front desk staff. I found them through Groupon and I have stayed with them, so that tells you a lot. They always work within my budget and I don't feel judged for that or pressured in any sales. I LOVED it there.. they was so nice! And the lip injections was not bad at all. The Dr. was so nice and helped me feel very comfortable. Highly recommend. God bless you all! Dr. Zachers is a master of his craft. I have been a patient for over two years and have had many different procedures performed with amazing results. After trying many different facilities for aesthetic enhancements, Mountain Radiance is by far the best in my opinion. The services are fine, and the receptionist is great. But may god have mercy on your soul if you ever accidentally miss an appointment. If you do be prepared for dr. Zacher himself to call you and reprimand you. He will try to force you to pay a $50 missed appointment fee over the phone immediately or you will never be allowed back. Do not get me wrong, I have missed appointments at other doctors offices before and have had no problem paying the missed appointment fee. But to call me, and threaten me? I don’t think that’s a very good way to run a business. I also paid for a package of three laser treatments, and only received two. When I told him to just take the $50 dollars out of that and then give the rest of my money back to me, he hung up the phone. I will never be back, and I would never recommend this doctor to anyone. Dr. Zacher has done my lips several times and it was quick and painless! The staff are friendly and welcoming. There is valet parking and they are extremely accommodating as well. My experiences have been five star and that is why I continue to return and refer. Thank you! I have been a client of Dr. Zacher's for over 5 years and have always found his work to be top of the line. As a registered nurse I am very particular about who I see, and I trust Dr. Z 100% with my comedic needs. From Botox to lip injections he always keeps every procedure pain-free and natural looking; which is what I request. Dr. Zacher’s work is amazing! From Botox to vobella lip injections his procedures are painless. After years with Dr. Zacher I have found his bedside manner and technique to be the best in Asheville. Dr. Z listens to every clients needs and keeps my cosmetic procedures completely natural; upon request. I have referred dozens of friends, family and co-workers and their experience has been the same. I’ve had Botox here and have had my lips done twice as well. Loved my results absolutely no pain, best place I’ve went for injectables hands down. Dr. Zacher is amazing- I was Very nervous because this was my first time getting filler… My lips look amazing and he was able to do it painlessly… It’s really quite nice walking into the beautiful Haywood hotel lobby where his office is located upstairs so it’s quite intimate and private… He’s very kind and sweet and just took all of my concerns away I went ahead and had him do some Botox as well so it’s been a wonderful visit. Great pricing too! Dr.Zacher and his staff are great! I've been in for botox, filler and just started laser hair removal and always have a great experience. Always in and out in a quick manner and never have to wait. They always have great deals going on as well! I did very thorough research (not all medspa providers are equal!!!) and I'm so very glad I chose Mountain Radiance Spa and Dr. Zacher. I'm absolutely thrilled with my results! Very natural, I look like myself—just better! Would be my little secret but can't help but telling all my friends. I'm just sorry I didn't go see him sooner! Great location, and incredible staff, I was so nervous but really shouldn't have been, everyone was so kind. Thank you all so much! I have been very pleased with the Botox treatment received from Dr. Zacher and his staff. They were available and very helpful answering all of my questions or concerns. I will definitely be a repeat customer. Most painless lip filler experience I've had! Dr. Z is very gentle, accommodating, and works with you to get your desired look. Dr. Zacher is professional, skilled, and fastidious. In addition to this, he has a kind bedside manner that put me at ease. His experience in anesthesiology is very helpful to his practice, as he knows how to prevent patients from feeling any pain. I am happy with the service and will be back. I’ve seen Dr. Zacher several times for Botox, lip filler, and under eye filler. I’m always greeted with a friendly staff and walk out looking great! I saw him today for Botox in my forehead and Volbella in my under eyes. The procedures were both quick and painless. I would recommend Dr Zacher to anyone. so finally after a lot of research at age 35 I decided to try Lazer hair removal. I've tried it for 2 areas of my most self conscious places my chin and armpits. I've only had 3 treatments as of now and my armpits are next to no hair growth my chin still needs a couple more times. I couldn't be more pleased from the chipper greating at the door to the professional approach from Dr Z. parking can be a pain but they offer Valle looking forward to my extra 10 minutes every day to use towards something else!!!!! Lip injections. I have seen their work on a friends lips. Fantastic ! I have been attending Mountain radiance for my aesthetic needs for over 2 years now. I am pleased with the service and results that I receive at every visit. Dr Zachers is extremely qualified, knowledgeable and experienced in his field. I trust every time I return that I'm going to get the results that I desire. I am extremely satisfied and would recommend Mountain Radiance to anybody interested in aesthetic enhancements or PRP treatment. I came in today for laser hair removal and it was so quick and easy! It was virtually pain-free for me and the Dr was very pleasant and informative. I got my first treatment free, and a really good deal on the next few. I would definitely recommend Mountain Radiance!!! Professional, knowledgeable, friendly - great results at a great price! Ive felt comfortable and informed since my initial appointment. I will recommend Dr. Zacher to anyone looking for natural looking medispa enhancements! He is absolutely AMAZING!!! He actually cares about his patients and if he doesn’t believe that something works, he will not do it. Which anymore it’s hard to find a doctor who isn’t just all about the money. I don’t do recommendations much but I would recommend him! Dr Zacher is wonderful! I've been 3 times now and every visit was pleasant and never any pain. I’ve been using Mountain Radiance for over 5 years now and LOVE Dr. Zachers work! He’s the best PhD I have found and has decades of experience- which puts my mind at ease. I feel extremely comfortable using him with his vast level of knowledge in the medical and cosmetic field. Mountain radiance does excellent work- whether it’s my Botox, laser hair removal, or a B-12 injection, they’re the best hands down! Dr. Zacher has a way of making procedures nearly painless! I’ve found Mountain Radience to be the best cost-value and reasonable around town, especially for the level of professionalism and experience. I just returned from seeing Dr. Zacher for the 3rd time for botox treatment since moving to the area. I love how easy it is to schedule an appointment and the staff is always kind. I plan to checkout the facials next! I will definitely be back to Mountain Radiance for future work, as well as refer my friends! Oh and parking.. I was worried at first bc it makes me anxious driving downtown and parking, but there have always been spots on the street right outside the entrance, Ive had no issues at all. I am so amazed wit the results i have achieved from my treatment with Mountain Radiance. Dr. Zacher is professional, knowledgeable and does an amazing job. 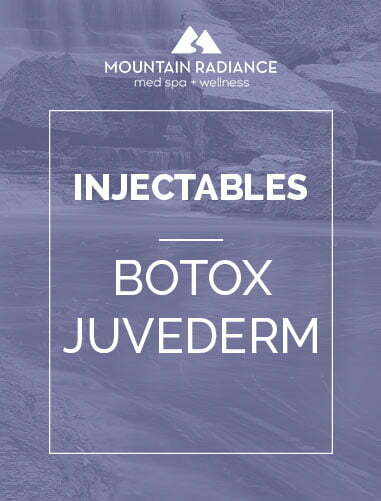 I would highly recommend Mountain Radiance to anyone looking for these types of procedures. I look and feel great!! The BEST in town, for sure. � Check them out!! Great location, friendly professional staff. I had three services at both the spa and the medical facility and am well pleased. The IPL on my sun damaged hands worked beautifully - no more spots on me! Special package pricing makes it affordable, too. New to the area- today I had an appointment with Dr. Zacher. I am so glad I did. First and foremost- he is skilled, kind and informative. He fit me in to his schedule with short notice, did exactly what I wanted (and quickly) and was simply a pleasure. And for those unfamiliar with the area- super convenient location downtown and quite frankly - a great deal. If you are on the fence- give Dr. Zacher and Mountain Radiance a shot... I am glad I did and I will be back! Dr. Z is very patient oriented and listens to what patient is looking for; he does not try to "oversell" and is very helpful In identifying treatment prioritizes that maintain aesthetic desire and budget. Painless injections with gentle use of lidocaine. I am very please with my treatment with Dr. Z and will continue to use him over other spa treatment centers used in the past. Dr. Zacher is very knowledgeable in his field. The results are amazing! If you are looking for a physician for cosmetic treatment choose Mountain Radiance Spa! I absolutely love going here. Dr. Zacher is a great doctor. I feel like he actually cares about the patients he sees and wants them to succeed in reaching their goals. He is always striving to help me reach my goal. Every appointment he makes sure to follow up on I feel that I am doing. He has a good tip for me to follow or some good advice to help keep me on track when I seem to backslide. He also reminds you that you are human and it is okay if you backslide a little. This is a great doctor that really cares! Dr. Zacher offers a wide variety of rejuvenating treatments for skin that is beginning to show the passage of time. With proper care, the appearance of aging can diminish. No one can turn back the clock but Dr Zacher has a knack for slowing it down. I have a lot of sun damage and Dr Zacker has successfully helped to remove it painlessly. Looking forward to the Kybella procedure. Don't wait to age beautifully! Dr. Zacher has helped me lose 28 pounds, so far. But, the big story here is that he figured out that I wasn't sleeping. He had me take a sleep test, at home, and I found out that I was waking up hundreds of times a night. I now use a machine at night that helps me breathe and helps me sleep. Gosh, how things have gotten better! I have so much more energy, I am able to lose weight, my feet do not hurt at night like they used to, my blood pressure is down, and I overall just feel great! Thanks Dr. Zacher! I've always enjoyed mountain radiance and the wonderful work done there . All of the staff are wonderful and Dr. Zacher has a true caring for his clients . A Med Spa that focuses on YOUR needs! 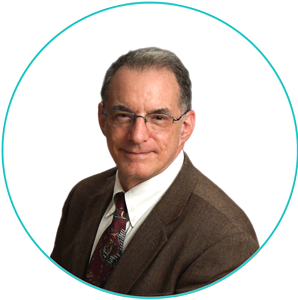 Dr. Zacher is a board certified MD with many years of experience with injection technology. He has an artistic background, a passion for science and finds that non-surgical cosmetic treatment provides the perfect marriage of science and art. Do not trust your skin to just anyone, choose a practitioner with years of experience and a history of high quality patient / client satisfaction. 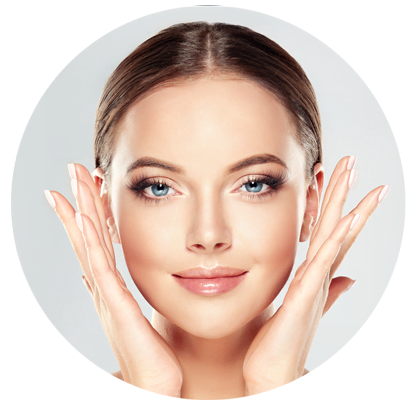 While Botox remains the most popular of our treatments, Dr. Zacher specializes in combining the latest technological advances with the tried-and-true techniques. For instance we can IPL (Intense Pulsed Light,which has been used for decades to tighten fine lines and wrinkles) with the latest technology - PRP - to improve and enhance healing. This combined technique has the ability to provide world-class improvement in the tone and texture of "crepey" skin that can form on the face and cheeks with age and sun damage. We can erase your wrinkles with Botox, fill shallow creases around the lips (kissing lines), deep creases between the nose and corner of the mouth ("nasolabial folds"), and smooth and raise the cheeks without surgery! 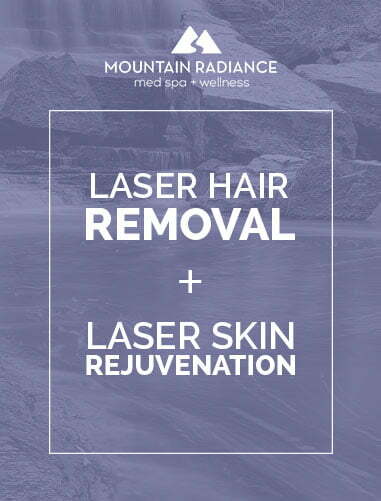 Unlike other med spas that use "one laser performs all services", Mountain Radiance Medical Spa optimally selects the right laser equipment for each procedure-giving you the best results from cutting-edge technology. Unlock the healing power of your blood to treat age-related skin damage, as well as early or moderate knee and shoulder arthritis and other painful conditions? 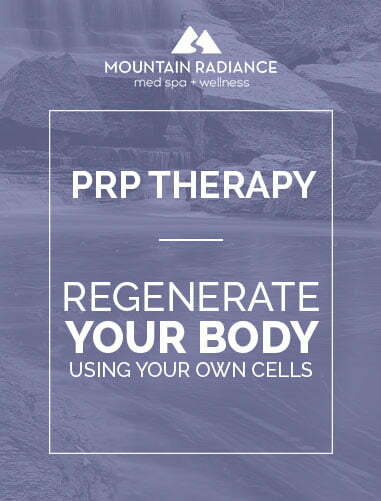 We use cutting-edge PRP techniques to heal your body naturally, using your own cells. Want to See Live Video Demos of Our Procedures? Three classes of injectables include Botox, Fillers and Kybella. Each of these plays a role in reversing signs of aging, improving appearance and increasing confidence about the way you look. The total experience is amazing! Combined techniques of Botox with fillers and topped off with laser therapies can create a "total face re-do". 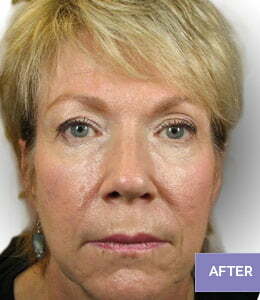 Check out our un-retouched before and after photos! Cosmetic treatment with Botox is the most commonly performed medical procedure to reduce fine lines and wrinkles, not only in the United States, but most likely the world. It is safe, effective, cost efficient (compared to say, surgery) and provides great looking results in the hands of an experienced practitioner. Fillers include Juvederm, Volbella and Voluma and Vollure. These are gels that fill deep creases and grooves. Treatment with these can lift, smooth and freshen the face in a way that will be significant but subtle! Everyone will notice but no one will know! Click here to learn more about Juvederm dermal fillers. Laser hair removal is performed by using a specialized laser light to pass through the skin, be absorbed by the hair follicle, which then heats up to the point of killing the follicle's ability to produce hair. The light is delivered in "shots" or impulses (each time the laser trigger is fired). Although there will always be some sensation with laser hair removal, the sensation is mild in most areas, and can be compared to a rubber band being snapped on the skin. At Mountain Radiance Medical Spa, we use prescription strength and powerful numbing cream to make the experience as comfortable as possible. Laser Hair Removal (LHR) is a technique that kills the hair follicles leaving the skin smooth and baby-soft without the stubble or pain of waxing. Discomfort is much less than waxing and the results are frequently permanent. Why shave? Why wax? These techniques are painful, time consuming and expensive. LHR is the perfect solution to having the legs and other areas look beautiful and smooth. Trade those expensive lady-razors in for laser hair removal! Popular with women are treatment of legs, bikini, underarms and sometimes, if needed facial hair. It takes 4 - 6 treatments approximately 1 month apart, but noticeable improvement. Facial hair on ladies is unsightly in most cases, LHR can treat that as well as long as the hair follicles are dark. One thing to remember is once hair turns white (with age) this treatment will be much less effective. Laser hair removal (LHR) is popular with men too! Areas commonly treated are the entire back, chest, abdomen, legs. Swimmers love to have LHR rather than shaving constantly for swim meets. Other areas men commonly treat are around the beard line around the Adam's apple as this can be sensitive to shave, sometimes around the back of the neck. 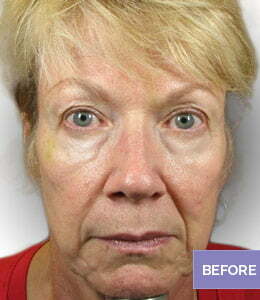 The power of laser light to rejuvenate your skin. Mountain Radiance can erase wrinkles with a variety of techniques - Fractionated CO2 laser is one of these that is a "tried and true" technique. It makes the skin smoother! Age spots ELIMINATED! Our brand of IPL (FotoFacial™) is one of the best techniques to address age spots. See my article on what causes age spots and what we can do to eliminate them! Men more than women can get small veins by the nose that can be embarrassing. Why put up with these when we can make them vanish at Mountain Radiance! Treatment again is with IPL. It just works! Harness the power of your body's own healing! The PRP (platelet rich plasma) process extracts growth and regenerative components from your own blood and can be directed to almost any part of the body! Reputation for recommending only the treatments needed to address concerns. Dr. Zacher has been board certified since 1988. Click this link to request schedule. A real person will review and schedule you! Valet Parking is available for all guests of Mountain Radiance. Pull into the 20 minute loading zone in front of the Haywood Park Hotel, lock your car and go to the hotel's front desk check-in. Give the attendant your keys and you will receive a ticket which will need to be validated by us before leaving. $50 deposit is required for new patients and patients and for patients who have frequently rescheduled. This will be applied to any treatment charge the patient may have. For instance with a $50 deposit, if the patient has a treatment cost of $150, only the balance of $100 will be charged at the time of service. The deposit is refunded if 1 business day notice is given for cancellations, and also refunded if the client arrives for the appointment but chooses not to have a service for any reason. The deposit is forfeited if the patient fails to show for a scheduled appointment and fails to give advance notice of a full business day. Saturday afternoon, Sunday and Monday are NOT business days for Mountain Radiance Medical Spa. Cancellations for Tuesday must be given by Saturday noon. Any patient failing to give advance notice for a confirmed appointment whether new or existing client will be charged a reschedule fee of $50 to be placed again on the schedule. The reschedule fee is a charge for an empty appointment slot and will not be applied to a future visit.